Work With Me — Soul Paint Co.
"I FELT LIKE I HAD BEEN DOING THIS FOR YEARS. I'M RIGHT WHERE I NEED TO BE!" Soul Paint is my passion. I’ve been painting since I could hold a paint brush. The creative process brings me peace, comfort, joy, and all of the juicy feel good vibes. When I built my Soul Paint business, I wasn’t thinking long term. I didn’t know how to expand, multiply myself, or impact more humans than just those locally. All I knew, was that I had a process that was changing peoples lives and I wanted to impact more. So I began to research online and invested thousands of dollars into learning how to bring my passion into the online space. And frankly, it was suuuuper overwhelming. There were so many systems, programs and strategies that I didn’t know which one to choose. I was in a constant state of “freebie overwhelm” trying to put all of the pieces together. I totally understand the overwhelm. I’m a serial entrepreneur at heart (seriously, since birth) who started out charging way too much for lemonade (a 5 year old’s gotta make moolah for those fancy rollerblades!) When I was 12 I started a jewelry line. At 14 I started a babysitting business. At 18 a photography business that made me some cash through college. 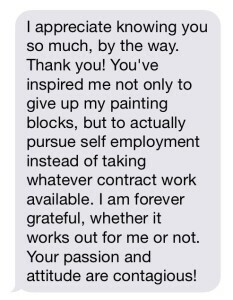 And At 22 I started Soul Paint Co., a painting company that provided art as a therapeutic technique, Soul Painting workshops, and coaching throughout the process. I loved each business, but I wanted to impact more…. Not only am I teaching my passion through my Soul Paint course, but I’m also helping other creative entrepreneurs package their passions and sell them online. I’ve worked with health coaches, artists, designers, and more to bring their visions to life in the online space. We get their website up, branding nailed down, packages formed, and we create a funnel that brings sales to them automatically. A one day intensive provides special, uninterrupted time unlike any other, and it allows you to get results quickly. Think of it as taking a plane ride to your desired outcome versus a road trip. Road trips are cool, but planes are faster. These intensives allow you to receive over 90 days worth of coaching material within one day. It’s a total game-changer for any woman ready to go BIG in her life & business. It’s about saying “YES! I’m going to make my business happen NOW” versus “My business will happen someday”. I’ve been coaching 1:1 since 2015 and have worked with women across the globe. The BIGGEST thing I see when it comes to entrepreneurship is that the winners take the risks and LEAP even when it’s scary. They have a dream and they go for it 100%. I rebranded my business at 7 months pregnant because I wanted to scale my business to provide even better for our son and family. In doing so, I created multiple courses, trainings, and sales content within a matter of weeks because I desired a change FAST. This VIP Day is your chance to have all of your business questions and headaches answered during our time together. We’ll put the pieces together of content creation, lead magnets, building your list and conquering your sales in ONE day. What does your authentic voice sound like? We’ll find out! Success can come quickly when you do the work, get focused, and seek help when you need it. I spent 9 months refusing help in my business because I believed that I could figure out this ONE thing. Turns out, I wasted so much time trying to ‘master the techy’ when I could have been selling and making money. Working with a coach 1:1 not only helps with the scary techy stuff, but it helps boost your confidence, focus your mindset, and direct you to your path of success. I fully believe how you do one thing is how you do everything. The way we treat our business is often reflected in other areas of our life. For example, if we’re not feeling confident in our offerings, we’re probably not confident in other areas of our life either. There’s a lot of clutter clearing that needs to happen when building a business – specifically around confidence and money. If we’re not confident in asking for the sale, we’ll never make money. Typical VIP Intensives begin at 10:00 a.m. and end at 5:00 p.m.
Not only is my VIP Day specifically designed to turbo-charge your excitement in creating the life & business of your dreams, but it’s a way to get LASER focused while having someone by your side with a plan already laid out for you. Show up. Do the work. And get to your goals faster. BOOK NOW AND GRAB YOUR BONUS: You’ll receive my 154 page Workbook on how to bring your business from offline to online completely free. If you’re not ready to build a course now, someday you will be and this workbook will get you there faster. The first few chapters are what I use with ALL of my clients, regardless of their business because I believe they’re ESSENTIAL steps to your growth.